The Monarch Butterfly is fascinating! It is a mystery of nature that enchants both young and old alike. My interest began several years ago with one monarch butterfly. Watching the beautiful creature flit around my garden, I observed the flowers on which it landed. This prompted me to do some research on butterfly garden plants. What I discovered is that there are two kind of plants to include when gardening for butterflies... butterfly nectar plants and butterfly host plants. I created a butterfly garden plan which included both of these types of plants. It wasn't long before... the monarchs arrived! This led to more research and I decided to try my hand at raising monarchs. I couldn't believe how easy it was and the miraculous butterfly life cycle captivated me! 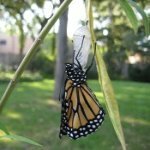 YOU can also raise Monarchs with my step-by-step guide to the life cycle of the Monarch Butterfly. The female monarch lays a creme-colored egg on the underside of a leaf from the milkweed family of plants. The hungry monarch caterpillar eats many milkweed leaves and grows from the size of a comma to about 2 inches long. The last molting of the caterpillar's skin reveals a beautiful green monarch chrysalis (right). In about a week the chrysalis turns transparent (left) about 24 hours before the monarch emerges. At last the day has arrived! The newly emerged monarch is drying its wings. Notice the "empty" chrysalis from which the monarch emerged on the right. Here is a sampling of the wide range of topics about everything butterflies found here at Glorious-Butterfly.com. Butterfly host plant - what does the caterpillar eat? Outdoor nature activities for kids - kids love butterflies! Christian butterfly symbolism - truly a miracle! The Butterfly Blog keeps you up to date with all additions and changes to the Glorious-Butterfly.com Web site. Subscribe here. Butterfly Photo Sets - Beautiful pictures of butterfly stages available for purchase...great ideas for school bulletin boards or home decor for any butterfly lover! Butterfly Shop - Find butterfly jewelry, butterfly gifts, butterfly crafts, plus interesting and unique items with a butterfly theme. Buy Milkweed Seeds on auction including Tropical Milkweed, Asclepias Curassavica, and Swamp Milkweed, Asclepias Incarnata. Butterfly Garden Plants - Cheap Butterfly Plants for attracting butterflies to your garden. Cheap Butterfly Garden Kit - Quick and easy butterfly garden kit Includes plants and instructions. Life Cycle of a Butterfly Video - This Monarch Butterfly Life Cycle Movie is perfect for the classroom or home. 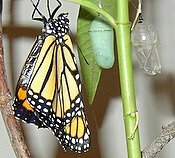 Photos, narration and video show the Monarch stages from egg to butterfly. Observe Life Cycle of the Monarch Butterfly with easy step by step instructions. Tagging Monarch Butterflies - Monarch Butterfly Migration pictures and information. Monarchs adore Milkweed family of plants – <b>Monarch butterfly</b> food source. Elementary Science Projects with a butterfly theme - Students love these science kits for raising a butterfly in the classroom. School Bulletin Board Ideas - Butterfly Bulletin Boards for Elementary and Kindergarten Science Projects. Favorite Classroom bulletin board ideas - Best interactive butterfly bulletin board for elementary that students and teachers will love. Searching for fall preschool ideas?? Monarch Butterflies provide theme for an easy science project. Best Elementary School Science Projects – Monarch Butterflies. Step by step guide for easy science projects raising monarchs in the classroom and growing tropical milkweed from seed. 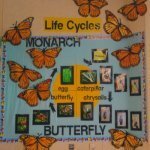 Elementary Lesson Plans - Free Lesson Plans for a Science Unit on the Butterfly Stages of the Monarch Butterfly life Cycle. Raise a Black Swallowtail Butterfly - Follow each phase......including beautiful photos. Butterfly Pictures - Digital Cameras are perfect for butterfly photography to capture the fascinating and beautiful butterfly stages. Christian Butterfly Symbolism - Butterfly life cycle......journey through life to death and resurrection. 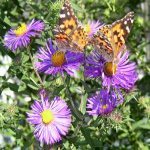 Garden, Nature and Butterfly Blogs - Interesting butterfly related blogs for readers to check out. Learn about this site and how Site Build It made it possible. Contact us with any stories, tips, questions, comments, or suggestions.